Dr. Martin Delany was the highest ranking black commissioned officer in the Civil War – but the road to that distinction was a long one. “As early as October, 1861, Dr. Delany, when en route to Chicago, stopped at Adrian, Michigan, for the purpose of seeing President Mahan, of the Michigan College. The subject of the war, which was then being earnestly waged, instantly became the theme of conversation, and the rôle of the colored American as an actor on its board was the principal feature therein. How and what to do to obtain admission to the service, was the question to which Dr. Delany demanded a solution. He stated that it had become inseparable with his daily existence, almost absorbing everything else, and nothing would content him but entering the service; he cared not how, provided his admission recognized the rights of his race to do so,” wrote biographer Frank Rollin. “Dr. Delany at once proposed that the application be made specially for a corps d’Afrique for signal service from the white division of the army. This was prior to the application of Dr. Gloucester to Mr. Lincoln for such an organization for Major General Fremont, or the order to General N.P.Banks,” wrote Rollin. “His main reason in urging the corps d’Afrique was, he claimed, with his usual pride of race, that the origin and dress of the Zouaves d’Afrique were strictly African.” Delany’s vision was not soon realized. But it took nearly two more years before the Virginian-born, Pennsylvania-raised, Harvard-educated doctor to be personally greeted at the White House. He may have appealed to Mr. Lincoln because like the President he had been a strong proponent of black emigration or colonization. Delany, who wrote The Condition, Elevation, Emigration, and Destiny of the Colored People of the United States, had even visited Africa in 1859 to prepare the way for a group of black emigrants, but the Civil War had turned his attentions homeward and to the recruitment of black soldiers. 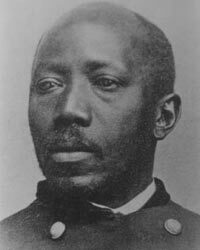 He became one of the relatively few blacks to serve as an officer in the Union army. On entering the executive chamber and being introduced to his excellency, a generous grasp of the hand brought me to a seat in front of him. No one could mistake the fact that an able and master spirit was before me. Serious with sadness, and pleasant withal, he was soon seated, placing himself at ease, the better to give me a patient audience. He opened the conversation first. “What can I do for your, sir?” he inquired. “Nothing, Mr. President,” I replied, “but I’ve come to propose something to you, which I think will be beneficial to this nation in this critical hour of her peril.” I shall never forget the expression of his countenance and the inquiring look which he gave me when I answered him. “Go on, sir,” he said, as I paused through deference to him. I continued the conversation by reminding him of the full realization of arming the blacks of the South, and the ability of the blacks of the North to defeat it by complicity with those at the South, through the medium of theUnderground Railroad, a measure known only to themselves. I next called his attention to the fact of the heartless and almost relentless prejudice exhibited towards the blacks by the Union army, and that something ought to be done to check this growing feeling against the slave, else nothing that we could do would avail. And if such were not expedited, all might be lost. That the blacks in every capacity in which they had been called to act, had done their part faithfully and well. “Certainly“‘ replied the president, in his most emphatic manner. “And what do you propose to do?” he inquired. “Certainly,” continued he; “a few light artillery with the cavalry would comprise your principal advance, because all the siege work would be on the frontiers and waters, done by the white division of the army. Won’t this be a grand thing?” he exclaimed, joyfully. He continued, “When I issued the Emancipation Proclamation, I had this thing in contemplation. I then gave them a chance by prohibiting any interference on the part of the army; but they did not embrace it,” said he, rather sadly, accompanying the word with an emphatic gesture. “But you of the North I expected to take advantage of it,” he replied. “No, not at all,” he interrupted. “I will show you some letters of introduction, sir,” said I, putting my hand in my pocket to get them. Just as he began writing the cannon commenced booming. “Stanton is firing! Listen! He is in his glory! Noble man!” he exclaimed. “What is it, Mr. President?” I asked. “What is it about, sir?” I reiterated, ignorant of the cause. Delaney was commissioned as the U.S. Army’s first black field officer 19 days later. Delany had already lived an eventful life. He was a prolific writer on the conditions of Americans in America and in Africa. Abraham Lincoln Papers at the Library of Congress. Transcribed and Annotated by the Lincoln Studies Center, Knox College. Galesburg, Illinois. (Letter from Charles V. Dyer to Abraham Lincoln, April 26, 1863). Frank A. Rollin, Life and Public Service of Martin R. Delany, p. 162-163. Frank A. Rollin, Life and Public Service of Martin R. Delany, p. 166-171. Abraham Lincoln Papers at the Library of Congress. Transcribed and Annotated by the Lincoln Studies Center, Knox College. Galesburg, Illinois. (Letter from Peter Page to Abraham Lincoln1, May 1, 1863).